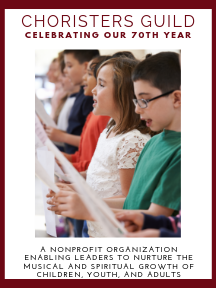 The Kansas City Chapter of the Choristers Guild provides mutual support and growth for children and youth music ministries in the Kansas City area. We invite you to visit our Kansas City Choristers Guild Facebook page for information on Chapter activities. To see our upcoming events, please visit the Choristers Guild Chapter Events page. If you are a choir director working with children and youth in the Kansas City area (Kansas and Missouri) we would love to have you join us! Visit the Choristers Guild Membership Page to learn more about membership benefits and sign up online, or contact us at the email addresses below so that we can connect with you. We look forward to welcoming you to our chapter.